On April 8, 1994, "Generation X" lost a legend. Kurt Cobain, lead singer for the immensely popular alternative rock band Nirvana, was, according to the official Seattle police report, "observed lying on the floor of [his] loft with a shotgun on his chest by electricians working on the property." The investigation also concluded that, "at this point in the investigation it appears the fatal wound to Cobain is self-inflicted." 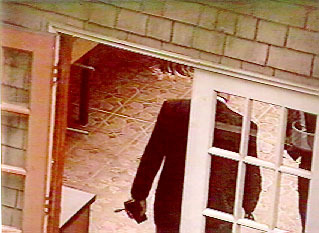 Immediately after the death, as with the deaths of many other icons, conspiracy theories of Cobain's apparent suicide shot to the forefront. Most of these theories seem to agree on one point; Kurt Cobain didn't commit suicide, he was murdered. To fully investigate these theories, some background information must first be presented. Cobain was the lead singer/lyricist of the Seattle "grunge" band Nirvana. His wife, Courtney Love was the lead singer/lyricist of the Seattle "grrrl" rock group Hole. Cobain's band members, according to several published reports, always hated Love, and, in some circumstances, referred to her as "Yoko," an obvious reference to Yoko Ono, John Lennon's wife, a woman sometimes credited with breaking up the Beatles. 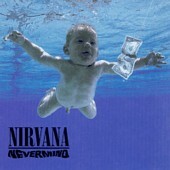 In early 1992, just after Nirvana hit it big with their breakthrough album, Nevermind, Courtney was pregnant with Cobain's baby. Cobain, though he grew up living a horrible childhood, still felt moral enough that he "knew [he] had to marry [Courtney.]" Now to investigate the actual "suicide." 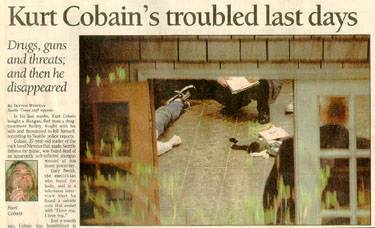 There are many answers that need to be revealed if Cobain's death is to truly be ruled a suicide. For example, why were no legible fingerprints found on the shotgun used to kill Cobain? Who was using Cobain's credit card two weeks after his death? And why were there two sets of handwriting on the so-called suicide note? When Cobain was first reported missing, Love hired Tom Grant, a private investigator, to find Cobain while she was away with Hole on tour. Later, after Grant's investigation was completed, he actually decided that Cobain was "most likely" murdered. However, since he was in no way affiliated with the police, his investigation was deemed unimportant. One thing that Grant discovered was that the leader of the punk band The Mentors, El Duce, whose real name is Eldon Hoke, claimed that Love offered him 50,000 dollars to kill "[her] husband." Though many would dismiss this as false due to Hoke's reputation as a lavishly embarrassing rock star, there's a witness. Karush Sepedjian, who manages the record store where Hoke was working when approached by Love, claims to have heard the conversation. 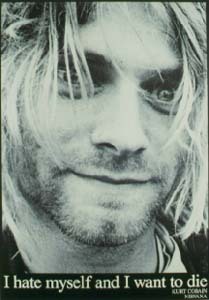 Sepedjian described the conversation on camera in the documentary Kurt and Courtney. "She said to him, 'Look, can you handle this, can you get this done? What do you want for it?' They were talking about Kurt Cobain!" To prove the two were telling the truth, Grant paid for each to undergo a lie detector test by Dr. Edward Gelb, considered the top polygraph examiner in the US. According to Gelb, when Hoke was asked the question, "Did Courtney Love ask you to kill Kurt Cobain?," Hoke's positive response showed a 99.91 percent certainty that he was telling the truth. Quite mysteriously, however, after Hoke gave an interview with Nick Broomfield for the aforementioned subject documentary Kurt and Courtney, Hoke was run over by a train just after being seen by friends with an unknown man. His death was ruled an "accident." Another item that Grant discovered is not so much the proof of a possible murder but more the discrediting of the suicide theory. Though Love later claimed otherwise, most reports have shown that Cobain never once attempted suicide or even toyed with the idea. Quite on the contrary, in an interview for Rolling Stone, Love claimed that while the two were staying at a hospital during the birth of their child, she had to convince Cobain not to commit suicide, "for the child." However, several reports, including those of hospital workers and even Love's father claimed that Cobain was never suicidal and that, in fact, Love was "most likely lying." Another item that Grant learned of while investigating the case that disproves the suicide theory is the "second set of handwriting on the so-called suicide note." The note was looked at by three different esteemed handwriting experts, each of which report a change in handwriting in the last four lines of the note. After Cobain signs the note with the words, "peace, love, empathy, Kurt Cobain," there is a space after which he writes, in what these handwriting experts call a different style, "Frances and Courtney, I'll be at your altar." Then, in an entirely different size and style of handwriting than the first come the words "Please keep going Courtney, for Frances, For her life which will be so much happier without me, I love you, I love you." In addition to this alarming evidence, Grant notes that before the second handwriting begins, the note reads more like a "retirement slip" than a suicide note. Not once in the beginning does Cobain mention the word suicide. This is probably due to, according to Grant, the much-publicized rumor that Kurt was planning on divorcing Courtney and retiring from the music industry. Love denies that Cobain was planning to divorce her, and, in a Rolling Stone article, states that the two "had a perfect marriage. PERIOD." Another important thing that Grant discovered was that Cobain wouldn't have even had the ability to pull the shotgun's trigger. 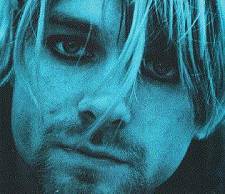 According to the official autopsy report, the level of heroin in Cobain's blood was three times the fatal limit for someone of his stature. Several esteemed doctors have testified that a person with that high a level of heroin would "not have even been able to stand up, let alone pull a trigger on a shotgun." This is yet another in the long line of theories that suggest another person was involved in Cobain's death. Lastly, another important part of this case is the mysterious role played by Hank Harrison, Courtney Love's biological father. Harrison, somewhat famous himself for having written two in-depth early Grateful Dead biographies, has claimed publicly that he believes his daughter was at least somewhat involved in the killing of Kurt Cobain, his son-in-law. "If Courtney didn't kill Kurt physically, then she drove him to suicide emotionally," he said in an interview for Geraldo Rivera in early 1995. It is this idea, the idea that Love's own father believes she had something to do with her husband's murder, in addition to the many other suspicious clues, that drove Tom Grant to devote as much time as possible to solving the case. He began a crusade to get it reopened by the Seattle Police Department, but he failed. To this day, the case has still yet to be reopened, or at the least reviewed by the department. Love, though she was actually the person who hired Grant, has several times attempted to have Grant lose his license. However, so far, she's been unsuccessful. For the fans, they're left to wonder what could have been. Some find solace in some of Kurt's lyrics. Dumb, a Nirvana song, is a song that helps many go on, "The sun is gone, but I have a light, The day is done, but I'm having fun, I think I'm dumb, Or maybe just happy, Think I'm just happy." Meanwhile, the conspiracies continue, and the theories become abundant, but in the end, for Tom Grant, and others associated with Cobain's death, all that's important is the truth.